SEEN IT CHEAPER ELSEWHERE? SEE IF WE CAN BEAT IT! 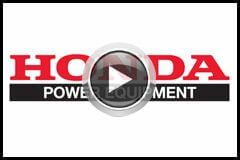 The Honda UMK435 Loop Handle is equipped with the latest Honda 4-stroke technology supplying more power and torque than ever. 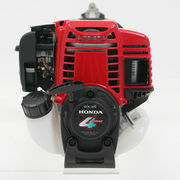 The engine is a GX35 mini 4-stroke engine which is lightweight and easy to handle. And of course the Honda engine will start first time, every time. The Honda GX35 produces low emissions and is very quiet compared to their 2-stroke competitors. 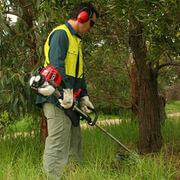 With the Honda brush cutter running unleaded fuel there is no need to mix oil and petrol! Your UMK435 is the perfect brush cutter for both commercial contractors and homeowners coming with an a 4 tooth metal blade and a commercial grade nylon line with bump feed. The auto-decompression, electronic ignition and anti-flood primer system, the GX35 will deliver and exceptional performance on all levels. And as per usually the UMK35 loop handle comes with a 4 year domestic warranty, as Honda backs their quality products in for the long haul and so should you. 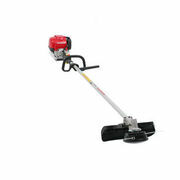 The four tooth blade that comes with the Honda UMK435 will enable you to cut through a tougher environment including blackberry bushes.